The Mayday! show in Rochester is over and I've already switched gears to start preparing for Buffalo Women's Gifts. Women's Gifts is one of my favorite shows that I do and this will be my 4th year! In case you're in the Buffalo area and are interested in attending, the show is held at Babeville on Saturday November 16th and goes from 10am through 5pm. Admission is free and there will be tons of great vendors and food trucks! Although I already posted these pictures on my Facebook page, I wanted to share them here as well. My friend Allison and I had a little fun posing the monsters for pictures during a lull on Sunday afternoon. 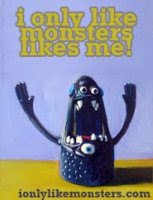 The monsters are meant to make you smile and I hope that these pictures brighten your day!